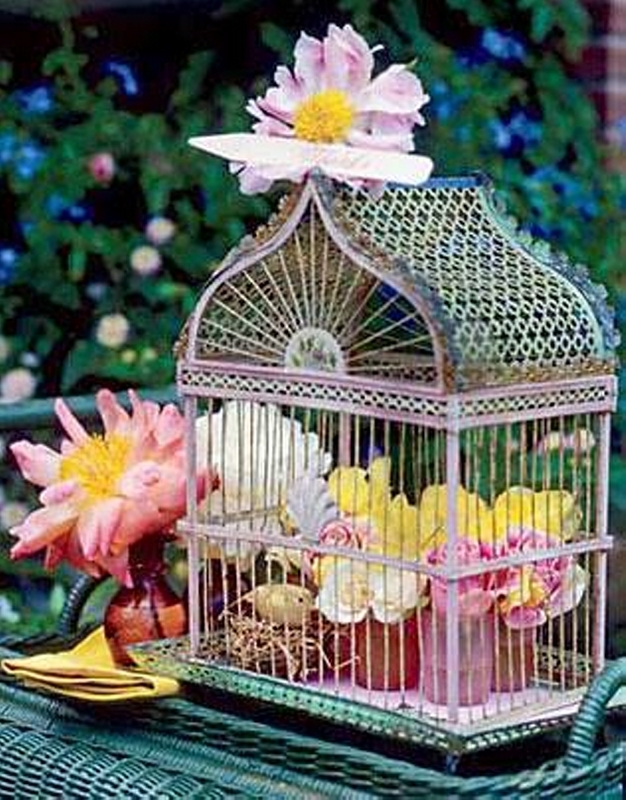 A cage is a very common object used as a bird enclosure for the birds worldwide. Mostly they are made with metal, though some traditional cages are also made using the wood. But what so ever is used to make them, they just look good as they are made in a certain pattern and lastly painted in charming colors to make it compatible with colorful birds. They are a best thing to prevent your birds from getting harmed. 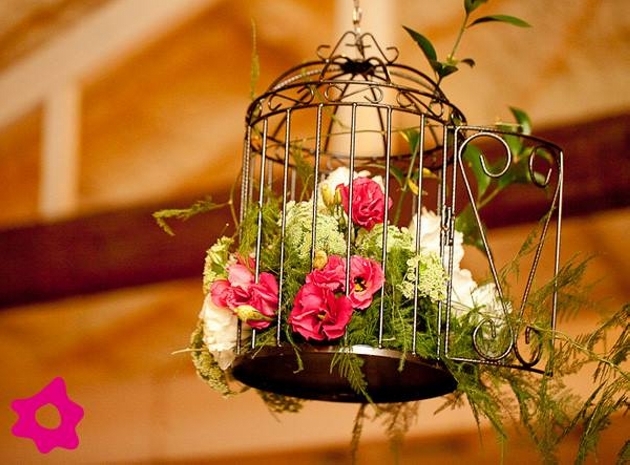 Here in this article we would be showing you some gorgeous cage decoration art ideas and you can choose your pick. Where most of our focus remains n recycling the dumped things, here using these metallic cages in upcycled crafts is a tremendous work. Hope you guys would enjoy this. Here is the first art idea where a number of colorful cages are hanged on roof like light globes. Wow, now this is a traditional wide cage for relatively some bigger birds. 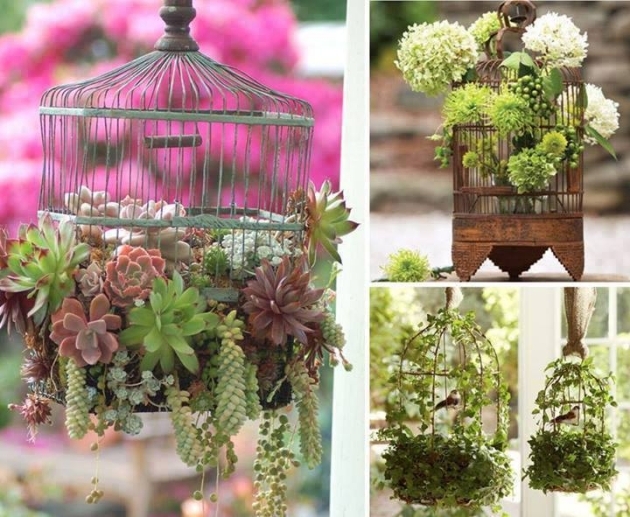 Now what I see inside the cage is just phenomenal, some small vases carrying one cut flower each are placed inside the cage. And the ordinary cage is turned into something exceptionally great as an art idea. Decency and delicacy have got its own class. 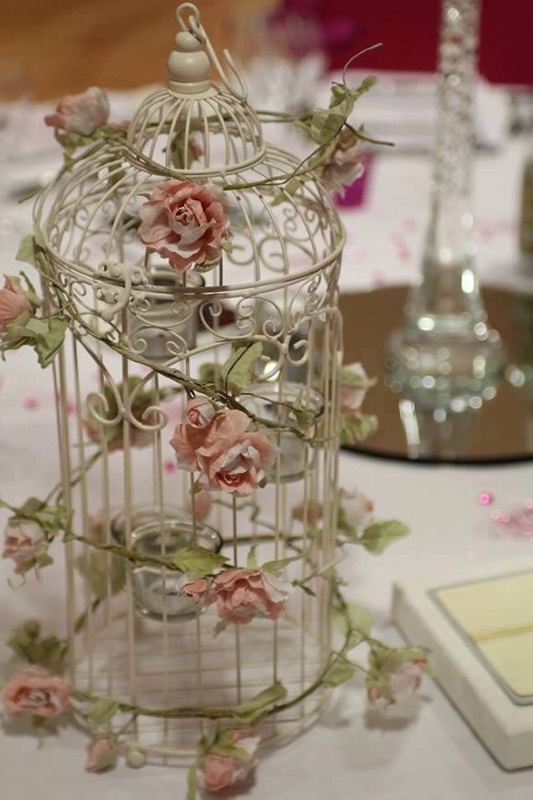 This circular cage filled with a bunch of pink roses is a presentation of you aesthetic taste and class. It shows your immense inclination towards art. 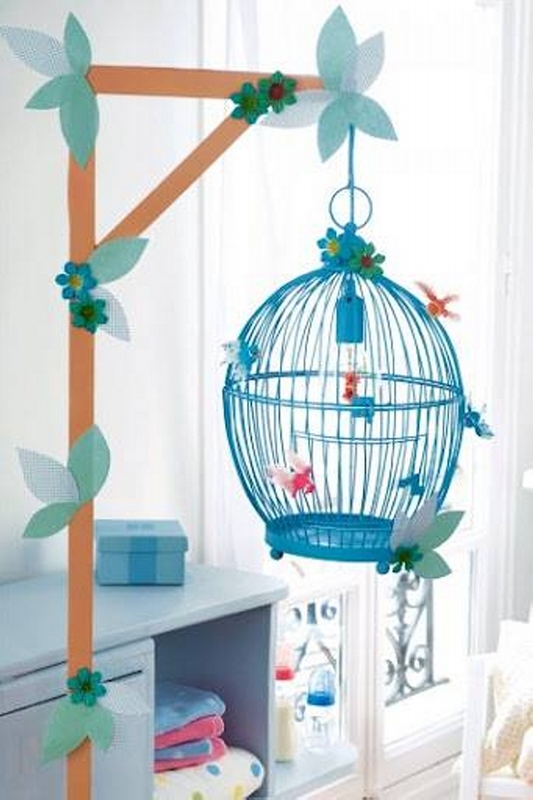 A just common metallic cage is turned into a great art craft by a little innovation. Now this is something exceptionally marvelous, the same metallic cage is turned into a very smart art idea. 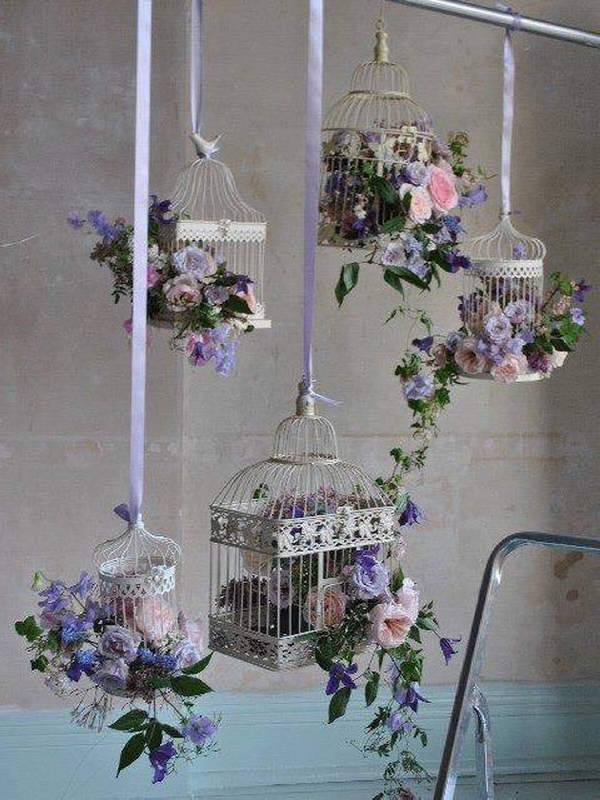 All you need in making this master piece is a used cage, along with a couple of artificial necklaces. Just wrap them around the cage in a random way and look what you have got. 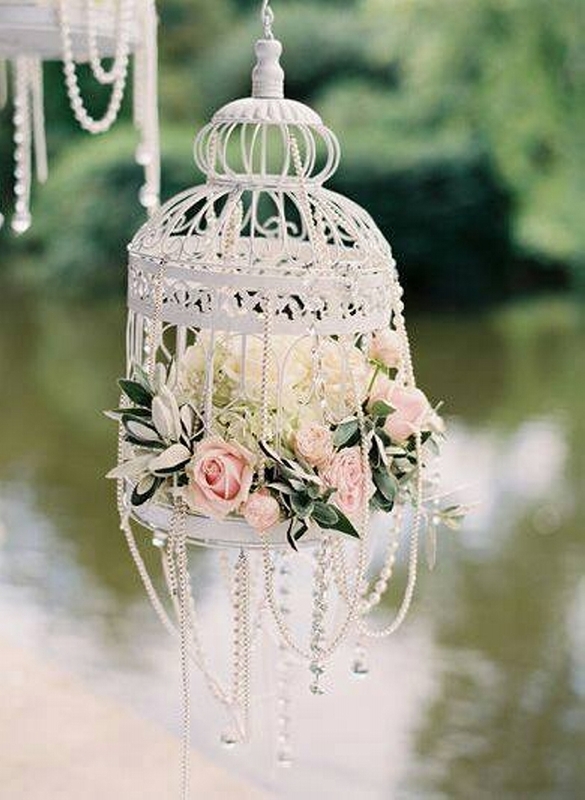 You would have seen a number of hanging art crafts, some stylish chimes, but never in your life you would have been across such a marvelous art craft made using the metallic cage, a bunch of roses, and again the same sort of artificial beaded necklaces that were lying idle. There are some shrubs and certain fuzzy plants that are frequently used in garden decor ideas and bouquets as well. They just look pretty good wherever they are used. Here they are given the same job again which I believe they have done in great manner. Look at this cute trio of metallic cages, but here they are not used for the birds and stuff but this time for a bigger cause. They are used in making delicate art crafts, and so they reflect hanging in the space being filled with a bunch of colorful flowers. 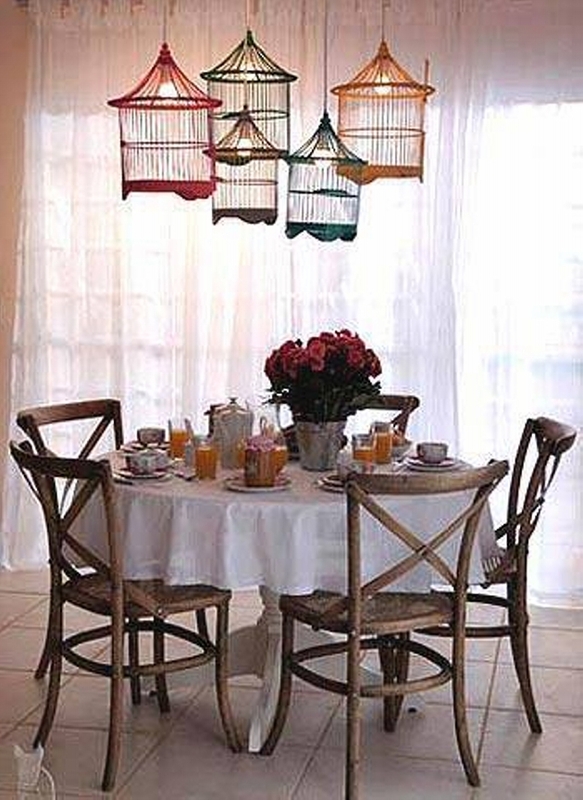 Wow, there couldn’t be a better place for this cage recycled art craft than your main dining table inside your dining room. It would be serving two purposes at one place, one as a decoration piece, and second to create an aromatic atmosphere around the table where you are going to have your meal. And now, this upcycling thing has turned into something innovative. 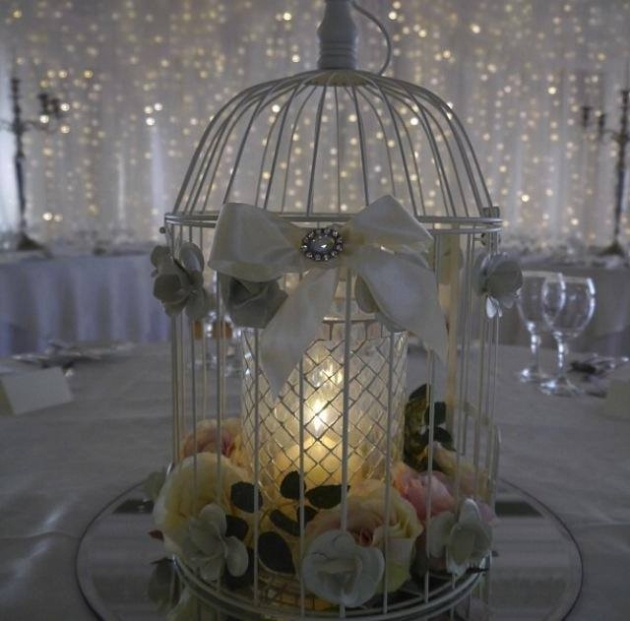 We have turned these cages into a candle carrier, who would have know earlier that these cages could be used in such attractive ways and pretty economically as well. The whole stuff like ribbons, flowers, mason jar and candle is a whole package of a decent art craft. 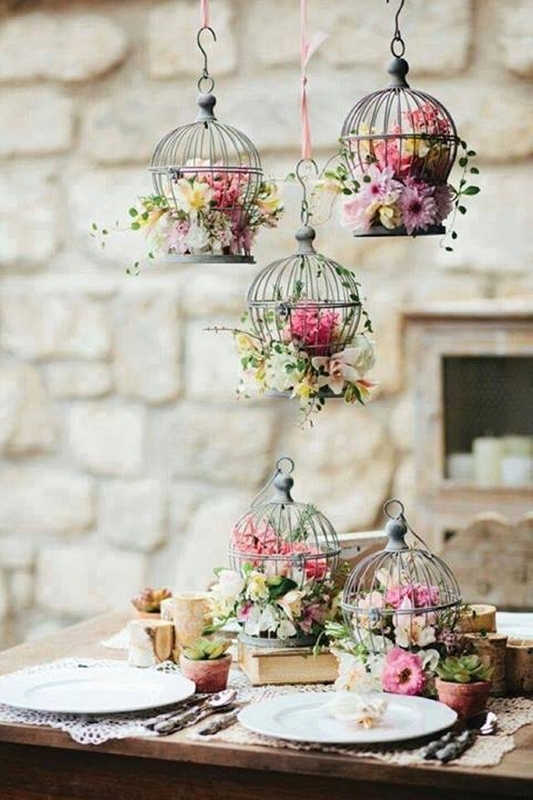 Look at the next beauty, how on earth you would find it to be difficult in making this pretty handy art craft using your bird metallic cage that was of no use anymore. I would love to have this one for me. 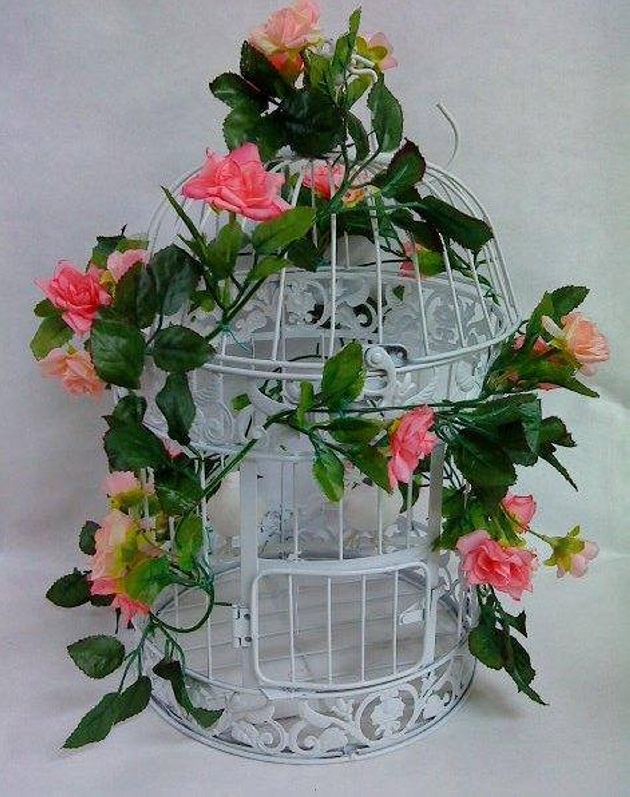 Now coming towards the next art craft of the day, look at the design and pattern of the cage, the cage in itself is an art depiction. 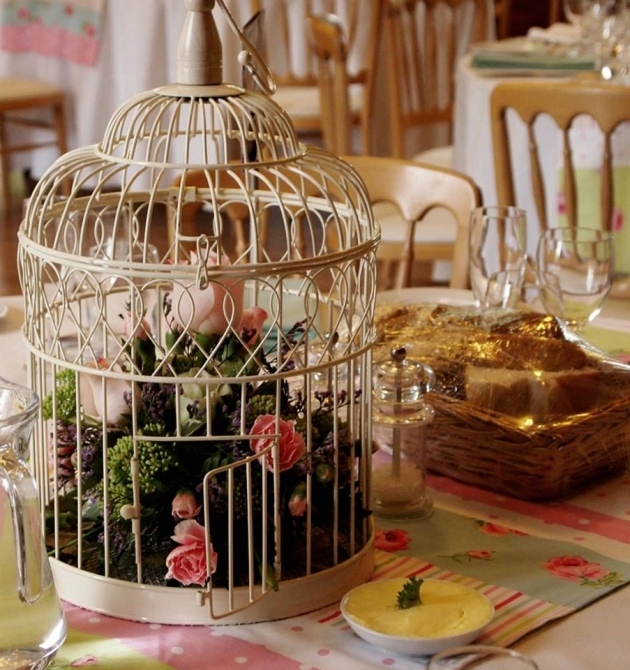 Then it is further embellished with cut roses where different cut flowers are just stuck on the bars. 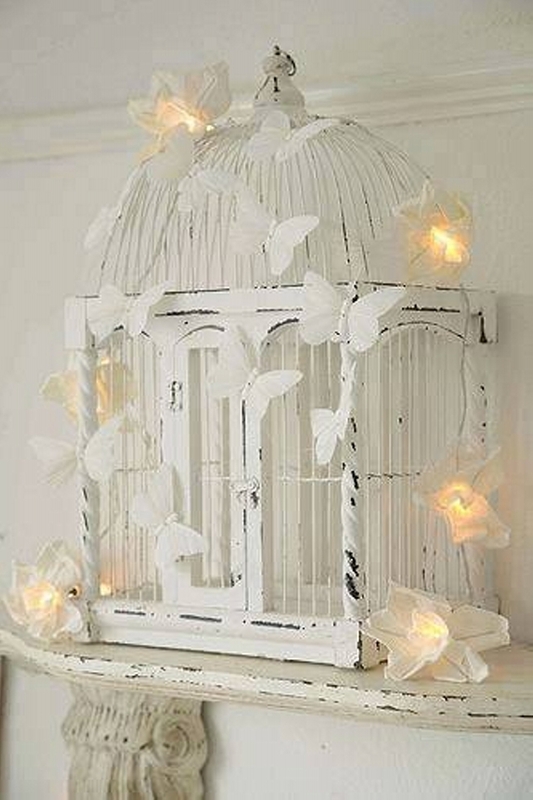 A cage could turn better that this art craft. The metallic cage has been given a very special treatment over here. 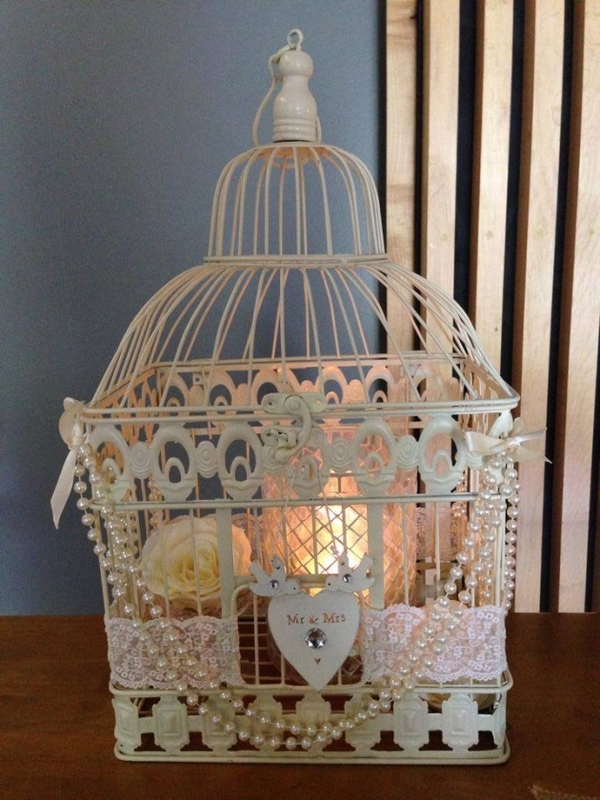 This squared cage is wrapped up with a number of things like net fabric, beaded necklace, cut rose, and a mason jar carrying a wax candle. This is worth giving a try. 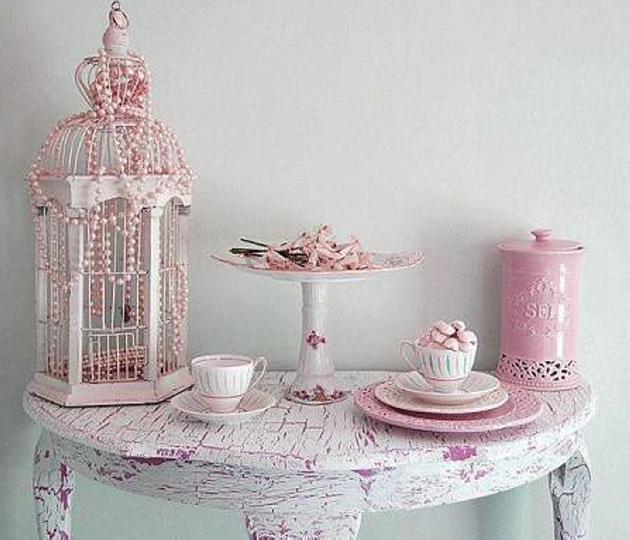 Now this is something exclusively great, I mean just look at the color combinations that are used in making this marvelous art craft for the decoration purpose. 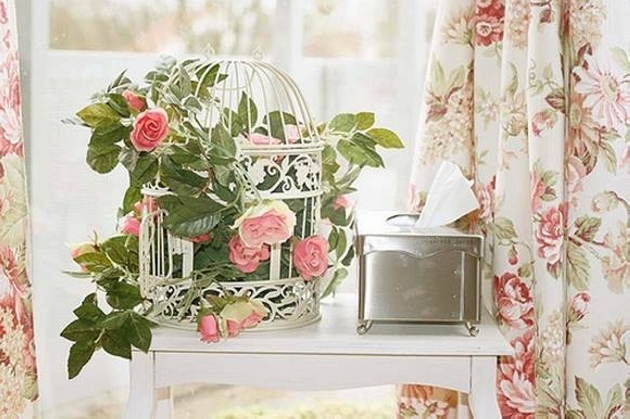 This royal cage is given the best feast with colorful flowers and fresh leaves. It is turned into a candle carrier. This is probably the simplest among all others. 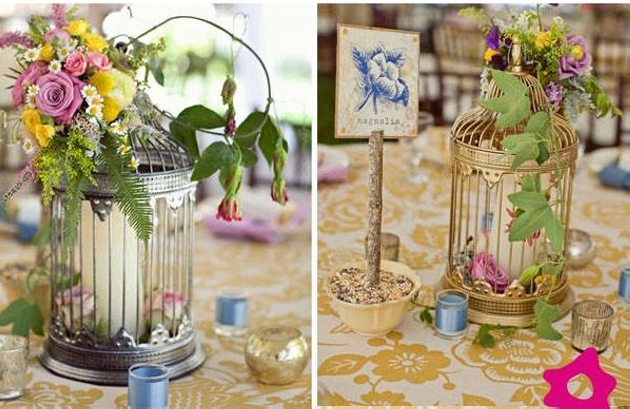 A very cute bright white stained metallic cage is used here again, and same cut flowers along with their receptacles. And they are just put on the cage firmly making it look like a bushy white plant that is decorating your home interior. 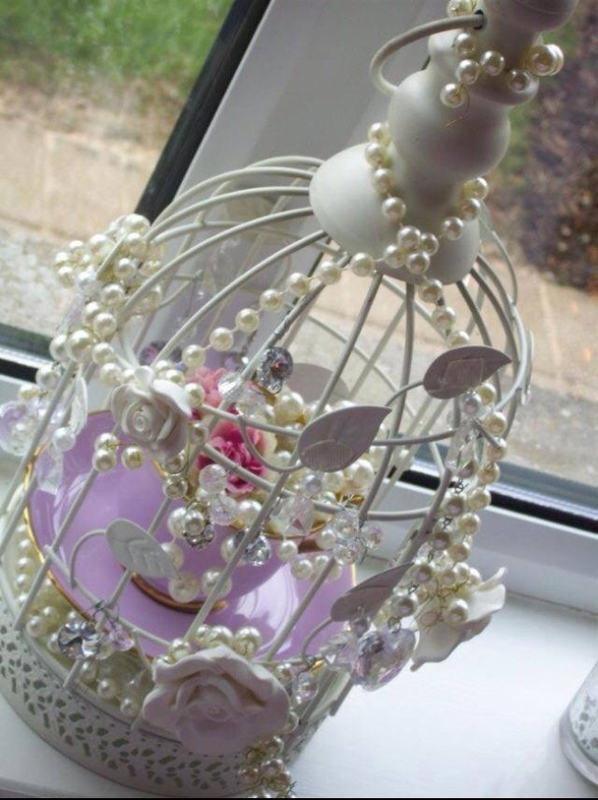 There is a whole range of cage upcycled decoration craft and art ideas. Though the same basic pattern is used but cages are different in shape and size. And when it comes to the flowers, purple and pink color is pretty dominant that makes them excessively eye catching. What would you say about this elipse or spherical shaped metallic cage colored as light blue. It is not over stuffed again like the earlier ones, a just a couple of little creepy caricatures are attached to the cage. And it is playing the best part of being an art craft just with a little effort. This one reminds me of an ancient tomb. The way it is made is just awesome. Though the texture seems a bit deteriorated yet it is used in a very damn smart manner. Little lighting tubes are injected inside the artificial white jasmines. And they are attached to the metallic bright cage to turn it into an awesome art craft using the cage. I hope all of these innovative ideas would help you doing something good for your home decor plans. But the only thing that is needed, is just giving them a try and trust me, they are all worth it.